To most fab shops, laser cutting systems – especially those equipped with solid-state fiber lasers – are the best thing since sliced bread. They’re fast, flexible and, given the right workpiece, will quite simply blow the doors off their turret punching counterparts. But what if there was a way to increase the throughput of these important machine tools several times over while simultaneously reducing labor and operating costs? A fully automated blank to bend solution offers the ultimate in productivity. If you’ve ever attended Fabtech or a regional metalworking exposition, you can probably answer that more quickly than the first few questions on Who Wants to Be a Millionaire. Even in high-mix, low-volume environments, automated material storage and handling systems are a no-brainer for any shop that wants to run around the clock with minimal human intervention. The problem is: what if you didn’t know any of that when you bought the laser? According to Dustin Diehl, laser division product manager at Amada America Inc., not having the foresight, knowledge, budget or part volumes necessary to invest in laser automation is nothing to worry about, even if those game-changing factors come years after the machine purchase. 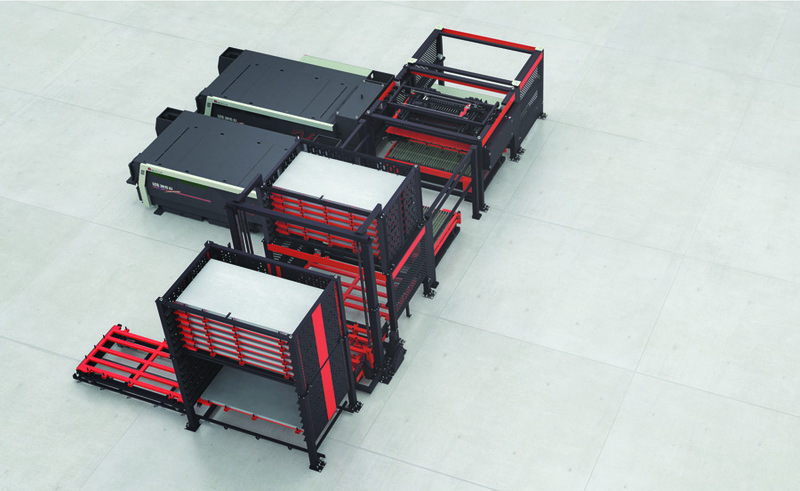 Twice as good: Modular automated material handling means adding towers or additional capabilities as the need arises. That automation might come in the form of a simple load/unload system with one pallet of raw material in, one pallet of finished parts out. The same system can be expanded to receive a 10-shelf tower. 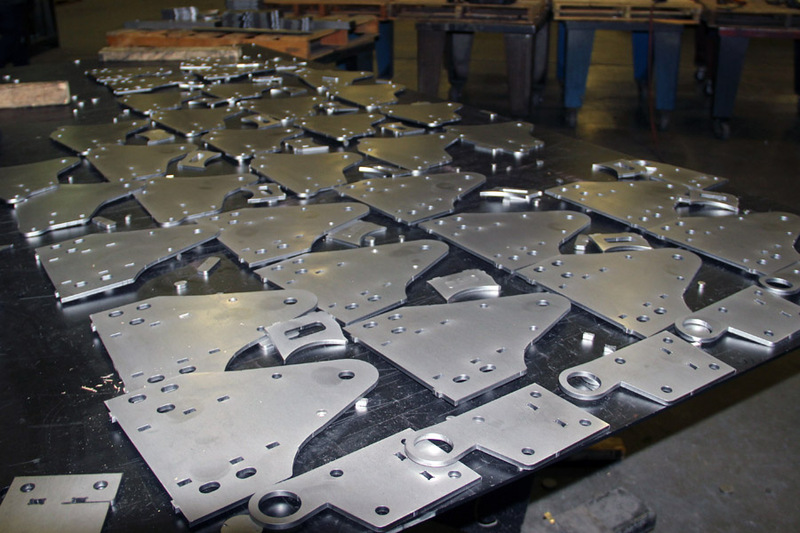 It could include conveyors or an AGV [automated guided vehicle] to carry cut products to the press brakes. And, it can be attached to additional output stations, robotic parts sorting equipment or be made part of a multi-machine production cell. “Whatever the requirements, we can grow with you as needed,” Diehl says. The word’s getting out. 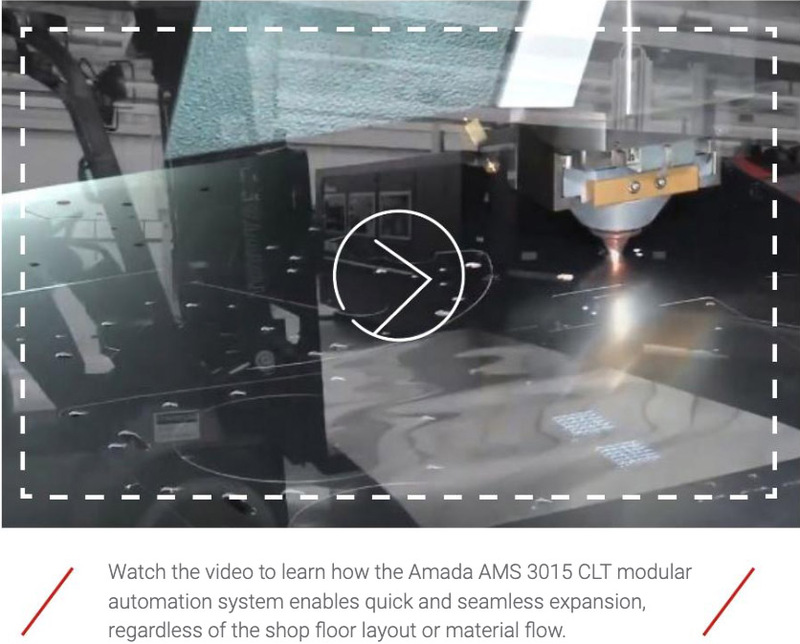 Since its introduction at Fabtech two years ago, Amada’s AMS (automated material storage) flexible automation concept has been installed at more than 200 shops, each one based on customer-specific needs and budget and with many arriving well after the laser’s initial installation. Diehl says none of this is surprising as the industry overall is trending toward increased automation, but notes that even something as relatively basic as a tower system remains a big leap for some shops. It’s also no stranger to automation. 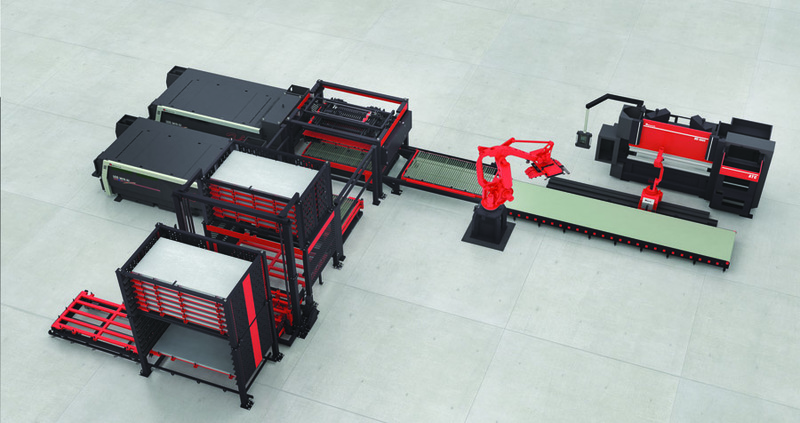 NSA Industries bought its first robotic press brake roughly 15 years ago and has since added several more, most recently, a pair of Amada HG 1003 AR and EG 6013 AR robotic bending systems. 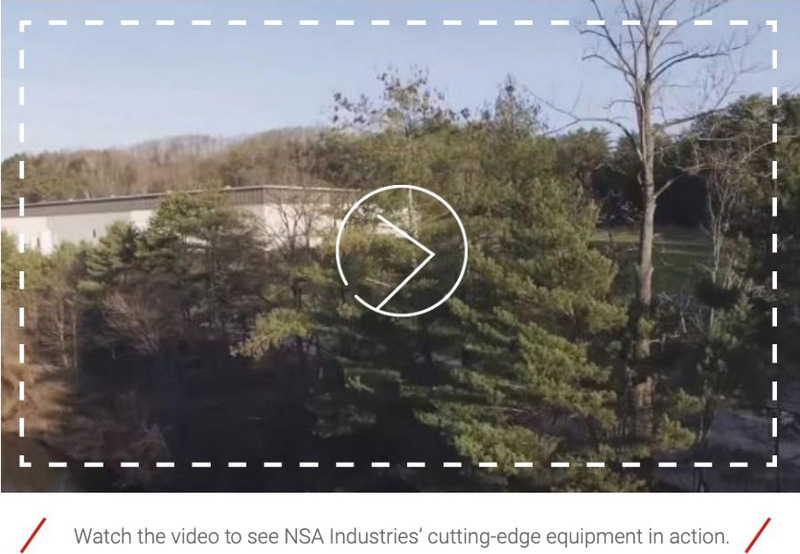 It also has automated pallet loading/unloading on many of its lasers and punch/laser combos, but it wasn’t until fairly recently that the NSA team learned the benefits of a multi-shelf tower, knowledge that Poirier wishes had come sooner. 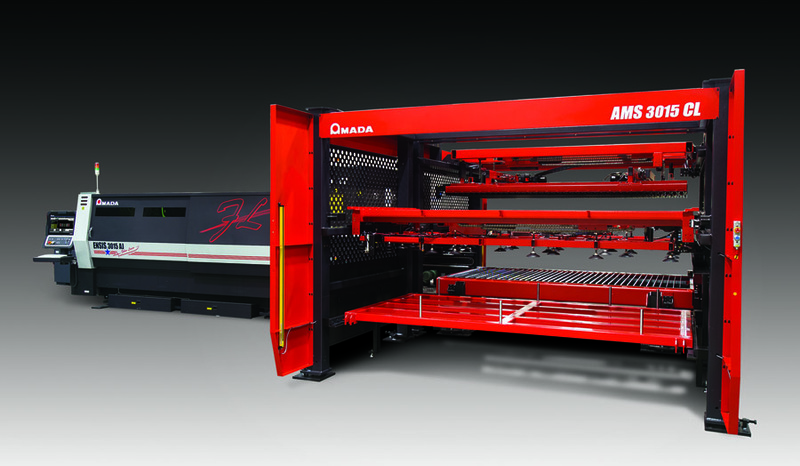 As with other Amada systems, the AMS 3015 tower can be installed at the same time as the machine or years after the purchase. Tanner Benetreu, president and owner of the Bill Benetreu Co., shares a similar success story. As one might have guessed from its name, this 40-something sheet metal and machining company was founded by Tanner’s father Bill, but was inherited by his son after Benetreu passed on several years ago. Today, the Bill Benetreu Co. has a dozen or so employees and a 40,000-sq.-ft. facility in Springfield, Ore., producing a range of parts for the off-road industry, sawmill equipment and general job shop work as well as several proprietary products, including lump crushers, roll splitters and other equipment for the area’s paper mills. At Bill Benetreu Co., the tower system allows tens or even hundreds of jobs to be programmed in advance and processed as needed, reducing work in progress. Like NSA Industries, the Bill Benetreu Co. has had some level of automation for many years, starting with a Cincinnati CL-7 CO2 laser in 1992, followed by a used CL-7 a few years later, each with dual shuttle tables. But when Benetreu realized in early 2018 that he could keep dumping money into his outdated equipment or upgrade to new technology, he traded both CL-7s in on an Amada LCG 6-kW AJ series fiber laser equipped with the same AMS 3015 tower purchased by NSA – in Benetreu’s case, however, the automation was immediately put to work. Unattended machining is great, but the system brings much more to the table than that. Benetreu’s quoted lead time has gone from two weeks to four days. The company has attracted new customers and routinely takes on lights-out overflow work from other shops in the area. Cutting speeds and, therefore, throughput have increased substantially. And of course, routine repair bills have dropped to zero.